Handy Manny is one of the friendliest people in town. He’s also one of the most patient, and is always ready to help those in need. He’s really good at fixing things. But what makes Handy Manny different from his contemporaries is that his tools talk. He treats all his tools the same and makes sure they all get along great. Handy Manny is a really simple guy as implied by his very basic outfit. He likes wearing a plain green shirt, denim pants, a red cap, yellow gloves, and brown boots. Kelly Crenshaw is equally simple. She wears a plain pink shirt, jeans, pink sandals, and light blue studded earrings. 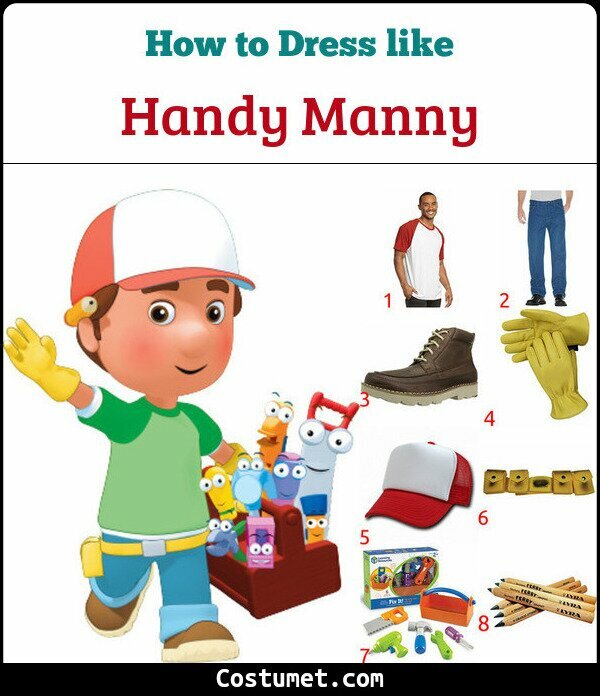 Here’s everything you need to look like Handy Manny and Kelly. 1 Green Shirt Wear this green and white baseball t-shirt as an alternative to Manny’s top. 2 Regular-Fit Denim Pants A pair of regular-fit denim work pants is a great addition to your Handy Manny outfit. 3 Brown Boots Make sure to wear brown boots to protect your feet while doing construction work. 4 Yellow Gloves Manny’s gloves are well-protected in his bright yellow gloves. 5 Red and White Cap Don’t forget to wear an awesome red and white cap. 6 Yellow Utility Belt Keep your building knickknacks organized in this yellow utility belt. 7 Handy Tools Don’t forget to bring along your friendly tools! 1 Fake White Collar Instead of wearing a full outfit, wear a fake white collar. 2 Pink Shirt Wear a plain pink shirt on top of your fake collar. 3 Mom Jeans Kelly likes comfy wear, and her mom jeans are the perfect example of that. 4 Pink Sandals Match your outfit with a pair of plain pink sandals. 5 Light Blue Earrings Kelly also accessorizes simply with a pair of light blue earrings. 6 Beige Fanny Pack Kelly keeps her essentials in a beige fanny pack. 7 Ginger Wig Wear a ginger wig to match Kelly’s hairstyle. Handy Manny was voiced by actor Wilmer Valderrama. Valderrama is also known for his role as Fez in That ‘70s Show. Kelly was voiced by Nancy Truman.